Alexandru Solomon: I wanted from the start to convey this claustrophobic feeling, because driving forces us to spend so much time alone in this capsule that is the car. So I didn’t want to get out of the car for 52 minutes, except for the beginning and the end. It was a tough decision; because of course this would set up a certain limit (you don’t get too much of the context of traffic in Bucharest) and a certain risk: maybe some viewers would get bored. I have followed my characters, or, let’s call them companions, for about four months, and of course this was a decision. As an element of contrast, I wanted the film to start with this crane shot, above the city, suggesting somehow that this world has completely turned upside-down. KK: Yes, it worked perfect… In Apocalypse on Wheels traffic is not just about crowded streets and cars…It is about people and their attitude towards each other. Were you aiming at constructing a greater metaphor of a contemporary Romanian society. AS: Sure. This is not a film about cars and traffic. I think traffic is a metaphor for a society, it shows how people interact, how they negotiate their common space, the public space, but also how does a society manage to regulate this interaction, through law and social values. 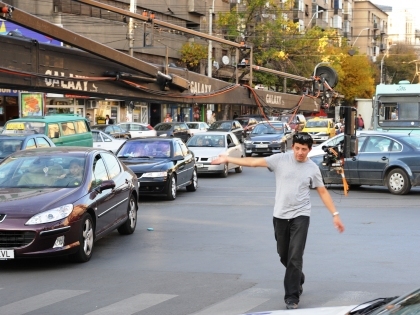 Traffic in Bucharest shows perfectly that human interaction in our society is distorted, that usually individuals don’t care too much for the lives of others, that law has little authority. Of course, the film is intentionally a sort of moral fable, that’s where the chapters come from. On the other hand, through the character of the delivery boy, I think one can understand that – in a chaotic environment, with poor resources – we are all conditioned to act not against the law and the others, but maybe outside the law and taking advantage of the others. KK: Traffic is an inherent part of a city life; one thinks of a famous traffic in Naples or Rome. What effects does it have on you? What does it turn you into? AS: I’m as nervous as any other driver in this city, I just try and control more. What is very bizarre in these circumstances, is that your lowest instincts surface and you feel that driving around becomes a life and death problem. I have seen apparently decent people, getting out from their cars in their tie-and-suit and starting to hit each other. You don’t argue with the one next to you in the car, that one is part of the „team”. But all the others are your enemies and you start hating them. KK: One of the drivers says ‘This city turns you into a wreck’ and we learn that there are 130,000 new cars in Romania each year and that every 1 in 3 car accidents in Romania ends in death… I have not even seen any bikes in the film, just cars all over… A Peru born mother states that in the past few years the country witnessed a greater consumption for cars and cigarettes. Another man mentions that few years back many shops would not even open by 7am, now the business functions from 6.30am each morning. AS: As you say, or as Gina says in the film, Romania is enjoying consumerism, after decades of communism. Before 1989, having a car was pretty difficult, and the only possible car was the Dacia, the Romanian brand. So cars are a symbol of social status, more than a house. Also, public transport in Bucharest is not something that has been developed at the pace of the growth of the city. Parking spaces are rare. It has become a city were one cannot walk (there are cars parked on the sidewalks), driving a bike is suicidal in these conditions. Consumerism is a phenomenon that has more to do with our post-communist situation than with the accession to the EU. I have met people who own a 50,000 euros car and still live in a horrible appartment block from the 70’s. And of course, traffic in the city has a lot to do with this new way of life, where people work long hours, sometimes having not one but several jobs and many of them come from the province to work in Bucharest. I wish the film should not be read as a stance against consumerism in itself, it is more about values being turned upside-down. Owning a car is for some people a passport to run over their fellows. AS: Of course, this is a huge problem. The problem is that – not only are regulations too soft – but that they are seldom implemented by a weak state, by a weak judicial system. One can see that the policeman in the film is reduced to watching helplessly the spectacle of chaos and has very little authority upon it. Maybe it is normal that everybody wants to get away with the consequences of an accident. In Romanian society, from older times, each individual tries to solve personally, by corruption, his problem, in a confusing, deregulated legal system. But the problem is that this way the society in its entirety suffers and finally each Romanian gets his share of injustice from this. Human life has little value in the end. KK: How much material did you have before you started cutiing it? AS: I filmed about 30 hours of rushes, so it wasn’t that difficult. The main stress was that I had this impression that most of the things that I was noticing while I was filming didn’t happen in front of the camera. I was constantly frustrated and my companions kept telling me that while I wasn’t there they witnessed this or that remarkable traffic event. KK: I liked the music in the film. Can you tell us more about it? AS: I wanted a piece of rock music to open the film, to accompany the crane shot. While talking to the editor and the commissioning editor from HBO on the music issue, this idea of Einstuerzende Neubauten came up. I think it’s an ideal fit and I am glad we managed to get the rights. AS: Nemescu and Toncu were ones of the most talented and most promissing filmmakers from Romania. Almost 3 years after their death, the court hasn’t reached a final verdict, the sentence for the author of the accident keeps getting smaller and smaller, while that driver was set free. It goes the same for Bianca’s case, the daughter of one of the drivers in my film. There is a very disturbing sense of injustice and helplessness, which is one of the reasons why I wanted to make this film. When I think of these stories, it seems to me again that Apocalypse is a very adequate word for what we witness. Two minutes with Anna Marziano- director of Mainstream. Joshua Zeman on process, guilt and the creation of legend.